Contextual Inquiry for Medical Device Design helps users understand the everyday use of medical devices and the way their usage supports the development of better products and increased market acceptance. The text explains the concept of contextual inquiry using real-life examples to illustrate its application. 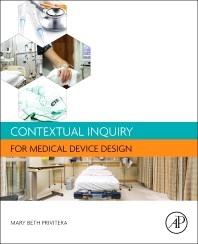 Case studies provide a frame of reference on how contextual inquiry is successfully used during product design, ultimately producing safer, improved medical devices. Medical device industry professionals in design, engineering, marketing and regulatory; students in industrial design, design research, and biomedical engineering. Privitera’s research focus is in collaborative medical device design and the application of human factors in design. She is a member of the Association for the Advancement of Medical Instrumentation Human Factors Committee and has coauthored various sections in HE 75 and recently a TIR on Contextual Inquiry. To date, she has been associated with more than 40 product releases, holds several patents and provisional patents, and has published and lectured on a variety of topics including design research, transdisciplinary/collaborative design, innovation methodology, and surgical techniques.